Hi! This is yui from Tokyo. Today, I'll introduce the world of food samples, whose article is on Wochikochi Magazine. Check the link below to see the article on Wochikochi Magazine. Food samples are very popular in Japan. You can find various food samples in front of restaurants in Japan, but rarely in other countries. Those food samples are very elaborated and look so real that you can't tell whether they're real food or not. "But they are only for business use, aren't they?" No, no, you can get them for your own or souvenir for friends! I went to Kappabashi Dougu-gai, which is an old shopping street in Tokyo. There are lots of various shops of tools like kitchen goods, hardware, interier goods, and so on. And of course, they have a shop saling food samples! Many products are for business use, but shops are on street so that you can feel free to go in and shop. In kitchen speciality store, you can find pans of various size and shape. In interior shop, you can find a pretty blackboad for cafe, or nice chair for your living room. "Oh, I've been looking for this for a long time!" "Wow do they have things like this!?" You can never get bored in this street! If you come near, please drop into Kappabashi Dougu-gai. 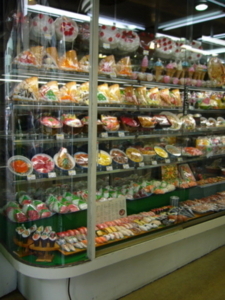 This is a shop of food samples in Kappabashi Dougu-gai. They have lots of samples in small space like this. You don't need these big samples? We have smaller one, too. For souvenir! They have good selections of keyholders and miniature samples. The most popular one is samples of sushi. That is because sushi is actually small, so it's easy to identify when it becomes a sample. 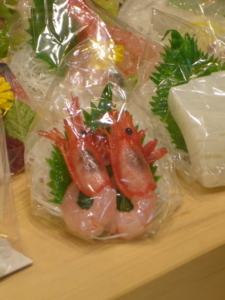 And also sushi is very famous Japanese food, so maybe it's a good choice to get it as a souvenir for foreigners. 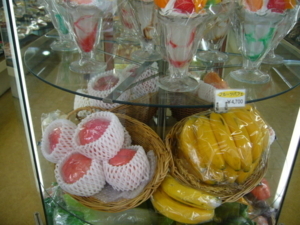 You can also find samples of fruits, hamburgers, and so on. Of course all of them look real! It is often said that Japanese craftmen are good at making things "smaller, thinner, lighter." Also the importance of detail and touch is a feature of Japanese craftmanship. These food samples are typical example of this spirit of pursuing reality, and sometimes smallness as well. Now you can find the world of food samples is quite deep! Mr. Sugamori, who had a lecture and demonstration in Sao Paulo, is a craftman with this spirit. We can see the spirit of Japanese craftmanship through food samples!